Capt. James G. Staley was from Monticello, IN when he enlisted 1/22/64 as a 1st Lt., into Co F. He was killed at Franklin on November 30th, 1864. The following is an account of his death. 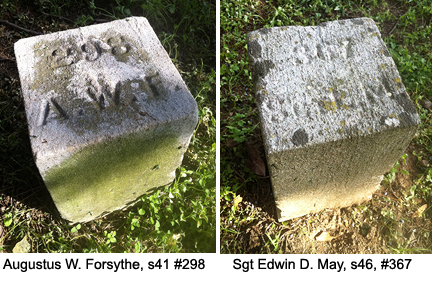 The 128th IN was positioned on the far left Union flank, in Stiles’ Brigade. They faced the onslaught of Scott’s and Featherston’s Confederate Brigades. “… the 128th Indiana occupied breastworks near the extreme left of our line; that the enemy charged right up to and planted their colors on our works, and that their dead and dying which filled the ditches, sufficiently proved how bloody and disastrous was their repulse. “When the assault was made, Captain Staley was standing up watching the enemy and directing the fire and the use of the bayonets of his men. Just then Captain Bissell, of the same regiment, was shot through the head and fell against Lieutenant Bliss, who, with the assistance of Captain Staley, laid him upon the ground and placed a blanket under his head. This had scarcely been done when some one called out ‘They are coming again,’ and all prepared to receive the enemy. As Captain Staley turned to the works, a minie ball struck him in the forehead, and he, too, fell into the arms of Lieutenant Bliss and died almost instantly. There was no time then to listen to parting words. A desperate hand-to-hand conflict was straining every nerve for the possession of the works. The deadly musket shot, the clash of arms as bayonet came to bayonet and sword to sword, the hurried breathing of the men through their shut teeth, their words of encouragement and mutterings of vengeance, with the thunders of the two pieces of artillery that flanked the company, combined to bring into heroic exercise every muscle of the body and every power of the mind. Captain Staley’s remains were recovered and brought home, through the efforts of the Christian Commission arriving at Monticello on February 7, 1865, and on the 12th were reinterred with appropriate ceremonies. 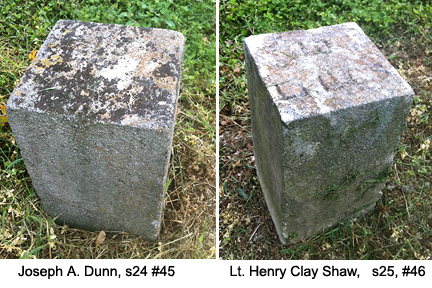 33rd MS soldier – Dunn – was killed on the very land now being preserved by Save the Franklin Battlefield and the Civil War Trust. 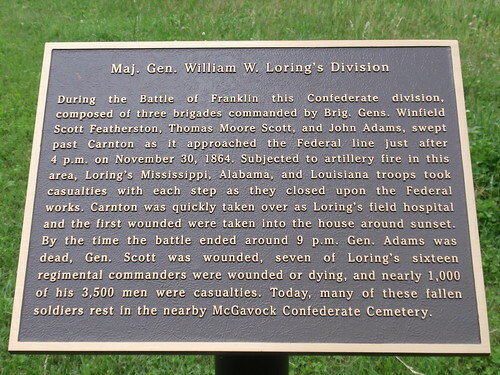 The five acre tract – Loring’s Advance – currently being preserved by a local battlefield preservation group was the very site that a Confederate soldier named Mathew Andrew Dunn was shot and killed on November 30, 1864, during the Battle of Franklin. Dunn was a member of Company K, the Amite Defender’s, 33rd Mississippi, Featherston’s Brigade. One of his commanding officers wrote his widow after the battle to detail the circumstances of Dunn’s demise at Franklin. He is buried in an unknown grave at McGavock Confederate Cemetery. The Civil War Trust is leading the preservation effort at the national level. I received a note from Mr Harrell a few days ago inquiring into the circumstances of your husband’s death. On the evening of the 30th Nov 1864, our brigade was formed in line of battle and moved through a very dense wood driving the enemy before us. On emerging from the woods we found ourselves in front of the enemy breastworks at Franklin. We were ordered to charge and at the word the Brigade moved forward your husband in the front rank. The charge was a gallant one, many of our men reached the works and fought for a while hand to hand with the enemy – but we were compelled to give way – and fell back some two or three hundred yards and there remained until next morning. Mat was killed in about 50 yards of the breastworks. He was killed instantly. During the night the enemy retreated and at daylight next morning I went immediately to the battlefield to look after my dead and wounded friends. Matt was one of the first I found. He was lying on his back. He appeared to be peacefully sleeping. A Spirit was on his countenance and everything indicated that he passed away without a struggle. He was wounded four times – two of which were sufficient to have caused instant death. One ball struck him directly in the front just below the breast bone passing through – another struck him in the right side passing through – another in the right cheek, and another in the left hand. Early as I was, others had been there before me and had taken everything of value from him. I found his testament lying near his breast and thinking of his widow far away, I put it in my pocket for you. I will be home sometime this winter and will bring it to you. My duty required my presence at other points and I left him. I saw afterwards that he received a decent burial at the hands of his friends and comrades. _____________ has preserved a lock of his hair for you. His mess mates tell me that he had no baggage except what he had with him (his knapsack and his blanket) and these were taken by the inhuman robbers of the dead. It would certainly be a consolation to you to have received some last messages from your loved one, but the unexpectedness of the battle and the circumstances of his death precluded the possibility of such a thing. You have two strong sources of consolation Mrs Dunn, that your husband died as he had lived, a true Christian, and his death was such as becomes the true soldier, on the battlefield with his face to the foe, and followed by love and regrets of all his comrades. Source: The Jonathan Dunn Kinfolks, 3rd Edition, 1987. 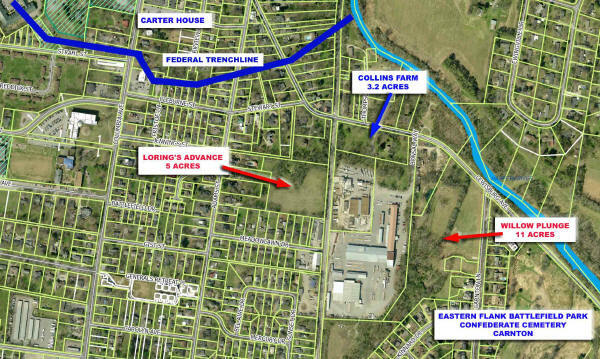 A local preservation group – Save the Franklin Battlefield (STFB) – has it’s eyes on 16 acres of Franklin battelfield land that is available for purchase. This is the same group that helped to arrange the purchase of the Collins Farm property in 2001. 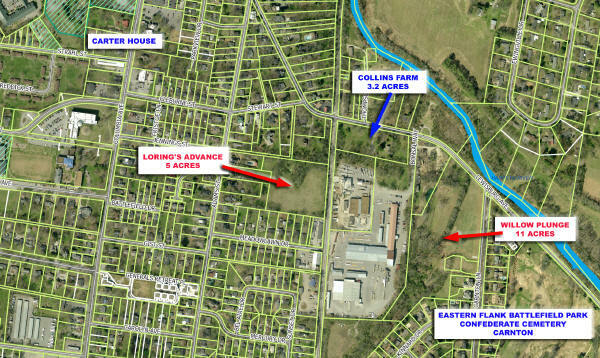 The new targeted parcels are close to the Collins Farm property. “We believe this is a truly unique opportunity to purchase undeveloped parcels of this size so near the Federal line. Both of these parcels are near the Federal trench line and are ground that Loring’s division traversed during the November 30, 1864 battle. Loring’s men advanced under heavy canister and musket fire from the main Federal line plus shell-fire from Fort Granger as they climbed over the RR tracks and assaulted this eastern end of the trench line. This is where Adam’s brigade had to shift to the west before charging into the enemy’s trenches,” says the STFB web site. Map showing the relative position of Loring's advance on the Union left flank. I think the 5 acres dubbed “Loring’s advance” on the map above could be quite an interesting piece of land. Loring’s Division, Featherston’s Brigade, came across this swath of land as the Confederates made their charge against the left Union flank which was defended by Col. Israel N. Stiles’ brigade. Confederate units under Quarles and Adams would have passed over this land under heavy fire from Union artillery position at Fort Granger on November 30, 1864. The 5 acre plot apparently has no historic structures on it, thus allowing the land to be returned to a pristine state. Particularly noteworthy is that this large parcel could be excavated for artifacts if desired. STFB is in discussion with national preservation groups to help purchase these parcels. If you’re interested in helping to support this project please contact STFB. 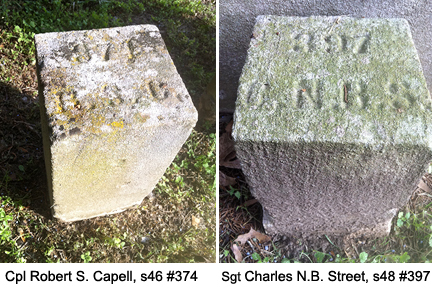 Harold’s father, Charles Conrad Becker, was a member of the 128th Indiana Volunteer Infantry. The 128th served alongside two other Indiana regiments on the far left Union flank at Franklin (Nov 30th, 1864): the 63rd and 120th Indiana. Those three regiments were part of Israel B. Stiles’s brigade. 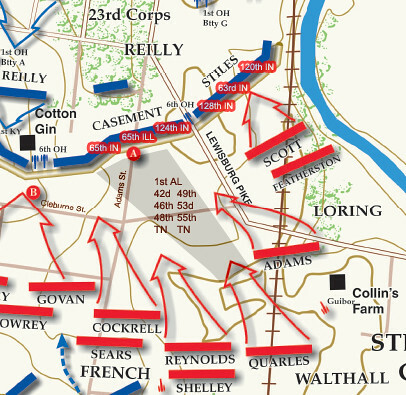 Stiles’s brigade assumed the furthest position on the far left Union flank that day, buttressing up against the Nashville-Decatur Railroad. 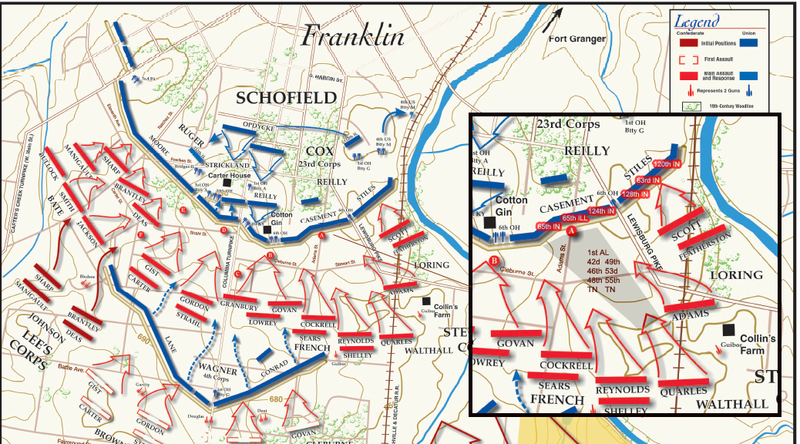 As you can see on the map above, the Confederate brigades of Scott and Featherston assaulted the far left Union flank by sweeping across what is currently known as the Eastern flank. Hundreds of Rebel boys were killed on tis part of the field including hundreds from Mississippi and Alabama. 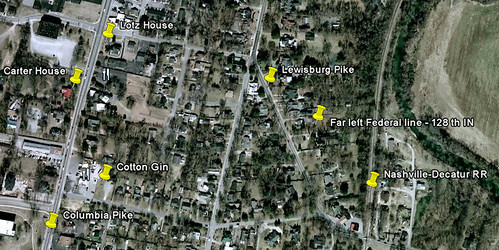 Here’s a Google Earth terrain map showing the position of the 128th at Franklin; click on the map for a larger version.